I’ve lead you through my sad stories of falling in love with an ASOS dress, only to have it not be available in my size. Examples: here and here. This morning when I fell in love with one of their dresses, I was preparing myself to be let down – for them not to have my size. Sadly, this time, the story didn’t change. The smallest size they had was a six, whereas I need their smallest offering, a size two. Though knowing I was not going to get the dress, I decided to search the name of the dress…see if I could find any bloggers rocking it so that I could tell myself even if I couldn’t wear the dress, someone was still doing it great justice. I did not find any bloggers wearing it, though my search was cut short when I clicked on a link to ShopStyle. Interestingly enough, they had two pictures of the dress. When I hovered my mouse over the top one, it listed size two as one of the sizes. Confused, I thought that ShopStyle must just list all the sizes ASOS normally carries or all the sizes an item comes in before it is sold out in those sizes. Curiously though, I decided to click the link to ASOS website. The dress was magically available in every size, including a size two!!! I went back to the tab where I had originally pulled up the dress on my own, and no, it was still showing the dress only available in a size six and up! What was with this? Honestly, I didn’t care. I quickly added the size two dress to my cart, still a bit weary that suddenly it might say the dress really wasn’t available. But to my greater surprise and immense relief, I am now the proud owner of the dress! That is, I’ve ordered it, and I’m crossing my fingers it’ll fit and be to my liking when it arrives! Finally! A dress from ASOS that I lust for is mine! Note: Maybe you are interested in the dress too, and need a size four or two? Here’s a link to the ShopStyle page that brought me to my available dress. Remember that open-back, peter pan collar dress from ASOS that I so desperately wanted a while back, but couldn’t get it due to my size being sold out in every version of the dress? Well, I certainly remember. In fact, it’s still for sale. And in fact, it still is not available in my size. Oh, how the lust has lived on though. But no. Yet again, ASOS is sold out of the dress in my size in not only the navy color, but in the other two color options as well! I did some searching and found out that the dress also comes in a regular, non-petite version, so I thought my problem would be solved…sure petite would be better, but I could live with the regular size. Yay! But no. This dress is sold out in all three colors in this version too! Seriously…how does this happen? Am I just late in finding this dress, or do dresses sell like the speed of light at ASOS? It just doesn’t seem fair! I know, I’m whining, but what can I say? I WANT.WANT.WANT. it! No, scratch that, I NEED it! Dramatic much, maybe? But seriously…I really would love to own this beautiful dress. Isn’t it beautiful? The soft blush color and scalloped detail…ahhhh! Love! I can see it working wonderfully this fall mixed and layered with other cozy pieces. What can I say? Apparently I’m loving the scallop detail! Actually though, I think I’ve been loving it for months, although I’ve yet to put it in my closet in some way or another! Am I alone in loving this scalloped detail, or do you love it too? Would you wear either of these skirts? This time, that lust is the Leather Tulip Skirt ($398). Can’t you just imagine the smooth, luxurious, butter-y goodness feel of the leather?! Mmmmm…I sure can! Don’t get me wrong though – besides a dreamy material, the skirt boasts a lust-worthy design. I’m always a fan of mixing the rougher with the more feminine for an eye-catching juxtaposition, and this skirt would be perfect for doing just that. Ahhh, the possibilities! Nevertheless though, that annoying thing called “price” is coming into play. At $398, I don’t think there is any way I’ll get to call the skirt mine. …Unless, you know, Anthro decided to gift me with it, along with every other piece of clothing my heart desires…. Do you guys adore this skirt, or is it just me? I have no clue at all what this would look like on, but there’s no harm in trying it, right?! ….But, the price. Oh, the price. It’s expensive. …But…if I try it on and it’s absolutely spectacular, I could justify it, right?! Here’s to hoping I can find it in store soon! Anyone share my love for this beauty?! Note: I originally posted this on Friday. I have some updates though, so scroll down to see! Thanks! Okay, maybe that was a bit of exaggeration, but it’s true that I adore this dress and Blair’s styling of it. Suffice to say that I want – no, NEED – this dress. There are a few problems: a) I’m not sure it would even look good on me (but there’s no harm in trying! ), b) the smallest size ASOS has is a size 2…although because it’s European sizing, it might run small which would work for me (size 00-0, barely 5 ft)….so those two problems seem workable, but, c) the dress is sold out in the size 2!!!!!! Nooooooo! UPDATE: After searching ASOS website, my heart nearly stopped again when I found a seemingly exact version of the dress in a solid color…but, none of the colors had a size 2 available either! The real bummer? This one was on sale for $35! UPDATE NUMBER 3: I heard back from ASOS (timely!) and I got what sounded like a somewhat generic email…their mission is to stay ahead of current trends, so they probably won’t restock. I emailed back to this, very respectfully, pointing out that fashion bloggers have recently wore it, and if they were to add more inventory of this specific dress, I’m sure they would sell-out once again, without a problem. The reply to this was that they had forwarded this to whom is applies at ASOS. I still have a twinge of hope left, but, sadly, I’m afraid I won’t get my hands on this beauty! I mean, of course, there is a very limited market for this dress…I think you really would have to be tall and slender to pull it off. That small demographic, unfortunately, does not fit petite-me. That, of course, doesn’t stop me from adoring it! 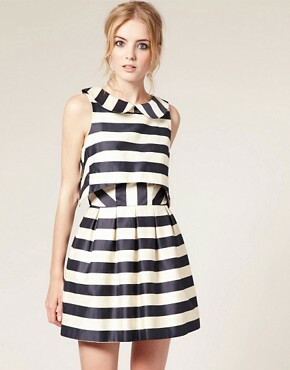 Dressed up or down, with bold color or neutral accents, with or without a hat, this dress has some great possibilities. Oh, and did you see the price?! At $178, this dress is one great deal as far as Anthro pricing goes.